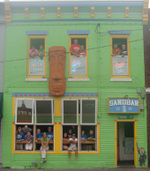 Island Retreat - The Sandbar...Home of the Indoor Hurricane! Do you need an escape from the daily grind? Longing for a relaxing getaway to an island oasis, with your toes in the sand and a tropical drink in your hand? Well, we can't change your latitude, but we can sure change your attitude! Sign up your office, business or organization for our new Island Retreat tropical happy hour, available on Wednesdays and Thursdays. Fun toys, great music and more! Email Andrew at andrew@thesandbar.com today to schedule your Island Retreat, and #LetsGetTropical! Please share this information with any businesses or organizations that you think need a fun and refreshing happy hour!